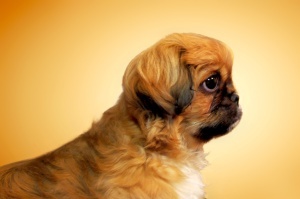 Just when you thought it was safe to go back in the water, here comes Fido! 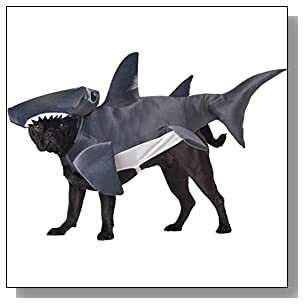 Every once in awhile, a costume is invented that you just know was meant to be worn by your dog - and the Hammerhead Shark costume is one of those must-haves. It’s brilliantly designed and so startling to see on a dog that people won’t be able to get enough of it because it looks like a shark walking around on land. Even if you have a tiny pooch, he’s going to look like he’s big and mean when he’s rocking this king of the sea costume. Now if you have a large dog, you can’t get this costume, because it’s not meant to fit dogs that are bigger than a medium sized pet - but for all other sized dogs, it’s the perfect fitting costume. 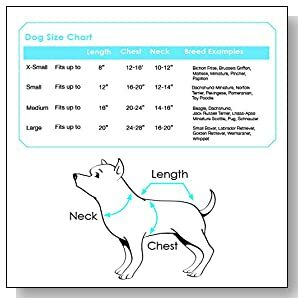 The fasteners on the costume go under the dog’s chin, one under the belly, and are both quick and easy to open or close - so you can get your dog ready or take off the costume in the blink of an eye. The costume is constructed of long lasting polyester, so it will be around awhile - but if you want to clean it, you can’t hand wash or throw it in a machine - you have to clean it with a lightly dampened cloth. There are two pieces that come along with this costume. One is the body, which makes up the majority of the material for the costume - but it’s the headpiece of this costume that really grabs attention. Just like a real shark, this costume has the beady black eyes that will send a chill down your spine. The headpiece also includes the rows of razor sharp looking teeth - but don’t worry. These teeth are made of foam so they’re safe to have on and around your dog and they won’t scratch or cut him. The headpiece itself is also made of foam, so it’s light and easy to wear. The body of the costume is lightly padded foam and features the middle fin that has struck fear in the hearts of many people through the years. 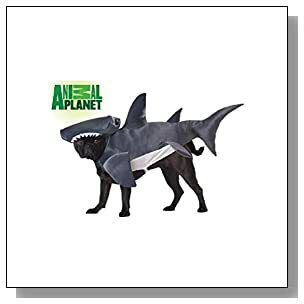 The tail of the costume is also lightly padded and long enough so that it hangs slightly off the dog, which helps to give the shark the lean and hungry appearance. The color of the costume is shark gray and has the white underbelly. The size of the costume is 15 by 18 inches and the weight is less than 10 ounces. Cute dog clothes can provide you and your dog with a lot of fun, and it will certainly get people talking to you in the street when you take him for a walk. Check out more here for ideas on both cute dog clothes as well as adorable dog Halloween costume ideas! Here are some fun and cute dog clothes that I've found for you to feature here... Often you can buy dog clothes here for much less than the cost in retail shops, and you get some great online bargains. I hope they give you some great ideas, and you can order them online to be delivered to your door!